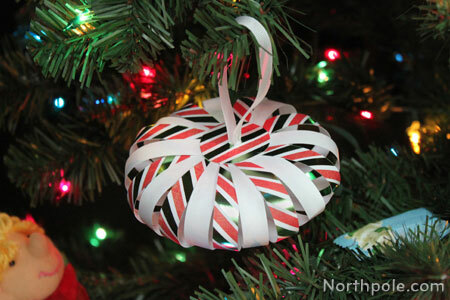 This little orb ornament can be made from any type of paper—copy paper, scrapbook paper, you name it! 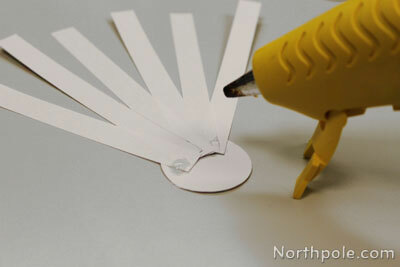 Add a personal touch by drawing on or painting the paper prior to cutting it. 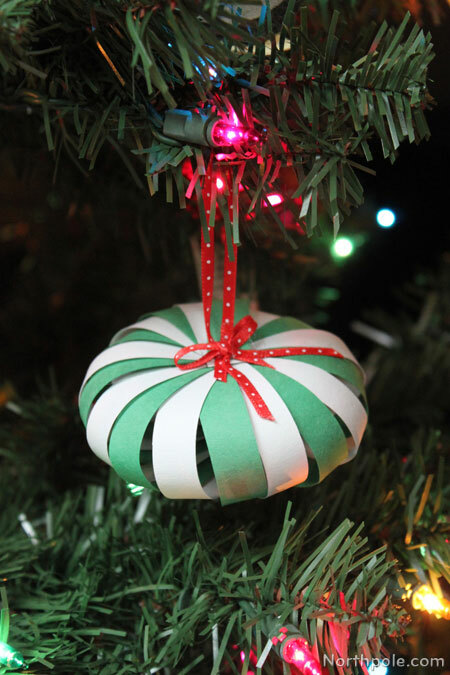 If you’re looking for some similar paper ornament ideas, check out these old fashioned paper ornaments and this balloon shaped ornament. 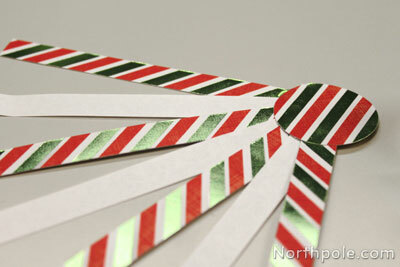 Measure and cut paper into strips 0.5" wide by 5" long. You need 10 strips from each sheet of paper, a total of 20 strips. Cut a circle that is about 1.5". Lay circle on working surface, printed side down. Begin gluing strips to the circle, alternating colors. Be sure to alternate colors, so that your ornament looks like this from the front. Place cutting mat on flat surface. 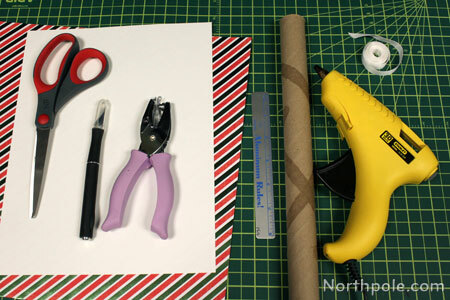 Place cardboard roll on cutting mat, and use your X-Acto to cut a piece that is about 1–1.25" long. Glue the cardboard piece on top of the strips in the center. Cut another circle that is about 1.5". Glue this circle on top of the cardboard piece. 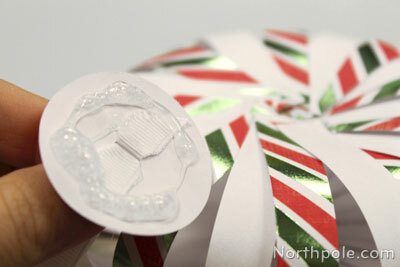 Begin gluing the strips on top of the circle, working your way around the ornament. Continue gluing until all strips are glued down. Cut another circle that is 1.5". Using the one-hole punch, cut a hole in the middle of the circle. Cut a piece of ribbon that is about 7" long. Note: Cut the ends at an angle to make it easier to push through the hole. 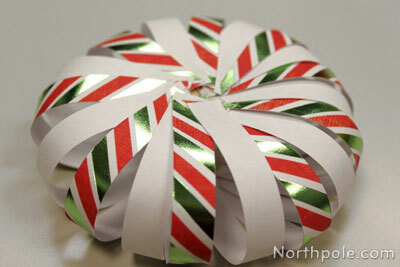 Push the ends of ribbon through the hole of the circle. Be sure that the ends stick out on the unprinted side of the paper. 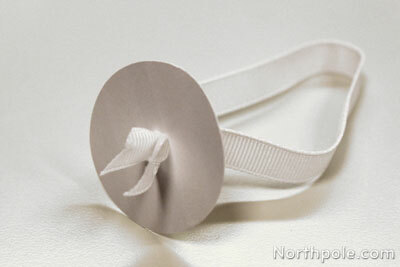 Using hot glue, glue the ends of the ribbon down to the circle. 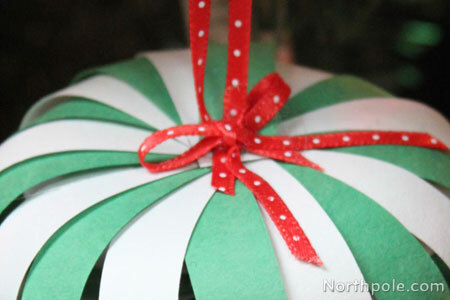 Apply glue to the unprinted side of the circle and press down onto ornament. We used a cardboard roll from an empty package of plastic wrap. If you don’t have a roll this size, you can make your own cardboard roll. Cut a couple strips of paper that are 1" wide by 11" long. 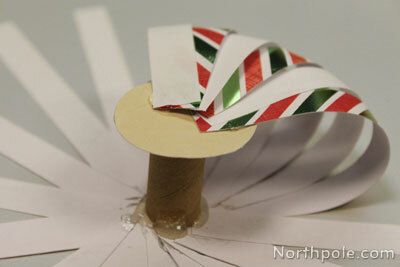 Begin rolling up the paper, securing with hot glue as you roll. 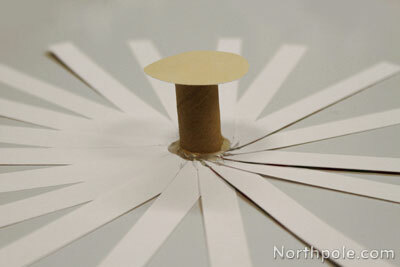 This will create a cylinder shape similar to the cardboard roll that is used above. 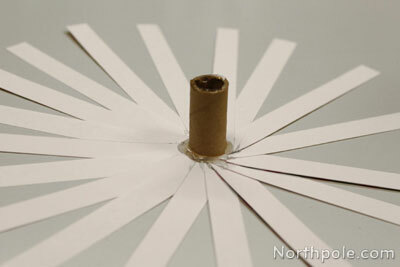 Don't try to make this without the cardboard roll because it will not have the same shape. 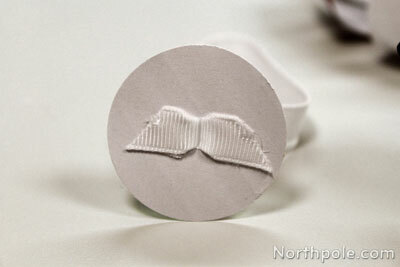 Use construction paper. Omit the circle in steps 15–20. 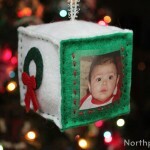 Glue ribbon directly on top of ornament. Tie a small bow and glue on top.